Nothing if not persistent, Councillor Eli Melky says he will take his concerns over an alleged council budget irregularity to the Minister. Right: Cr Eli Melky, photo from our archive. The amount involved is $531,000 allocated in the 2017-18 Municipal Plan as part payment of the Civic Centre loan. As we know, the full loan was subsequently paid off in full, largely thanks to Cr Melky’s efforts. In a long presentation to council last night Cr Melky argued that the current Municipal Plan should have been adjusted for this amount. Council’s Director of Finance Dinesh Pillay explained that as the loan had not been paid off until after June 30 this could not be done. However, the mid-year review of the plan reflects the current position. Council has redirected the amount allocated for the loan repayment to capital works along Ilparpa Road. Cr Melky argues that the fact of its inclusion in the Municipal Plan means that as a matter of arithmetic it will continue to be reflected in budgets going forward, costing ratepayers millions over the coming decade. 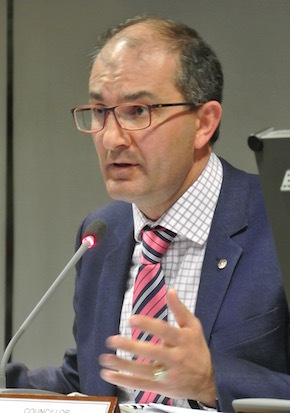 His argument eluded his fellow councillors and was rejected by Mr Pillay, who explained that the budgeting process works the other way round: it starts with an assessment of the revenue required to do all of what council wants and has to do; this determines how much needs to be raised, principally by rates. The process does not start with a revenue amount and then distribute it. @ Richard – If the budget was already completed and passed it couldn’t be changed until the following year. Posted March 17, 2018 at 9:25 am. Richard, the Local Government Act is clear on this issue. Council may, after adopting a budget for a particular financial year, adopt an amendment to its budget. Additionally and according to the LG (Accounting) regulations Council must not allocate money for a particular purpose unless: (a) provision for the allocation is made in the budget for the relevant financial year. This is where I argue in favour of the people, the fact that the 12th Council, (last council) members approved both the Municipal Plan 2017/2018 (including budget) and the payout of the civic centre loan, on the same night. However, it did not amend the budget to reflect that we no longer needed $531,000. An amendment should have been made that night to reflect not only the change in expense but also in the change of income from ratepayers. Simply to say that the budget has been amended (as advertised 6th of March 2018): This only reflects the change in line item expenses and not the revenue line generated from rates. I am happy to say we no longer have an expense line for loan interest or principal payment, however I would also like to see the revenue line reduced to reflect same. You see, Richard, the amount of revenue charged to rate payers for 2017/18 financial year is $21,867,446 as approved on the 26th of June 2017 by the 12th Council. Council must make further amendments to the budget by reducing the revenue generated from rate payers to reflect the expense no longer required of $531,000. The amount generated by rate payers should be $21,336,446. This will ensure we do not go on collecting this amount year in year out, which will add up to millions of dollars over time. Mmm, as usual Cr Melky fails to grasp even the most basic of budgeting principles. It is pretty much in line with his earlier confidence in predicting a budget surplus of around $12.6m last financial year, even promising to resign if he got it wrong. The half million Cr Melky is worried about will not appear on the next financial year’s list of expenses so council will not need to raise funds to cover it. This should translate into a much lower or even no increase in the rates this time round, unless of course councillors who don’t understand what they are doing force additional cost onto the community. Try working on that, Cr Melky, perhaps you could promise to resign again, if there’s an increase … just a thought. Council has redirected the amount allocated for the loan repayment to capital works along Ilparpa Road?! What about a portion for Brown and Priest Streets to build a bike / pedestrian crossing?